I use this as a quiz after teaching the soft and hard c phonics rule. 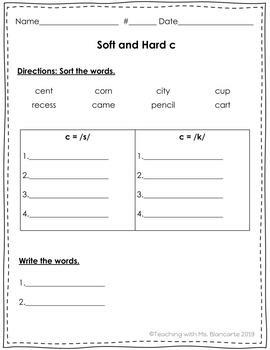 Students sort soft and hard c words by their sound. I then give students 2 words to spell. Save Money by Leaving Feedback! Earn TpT Credits for purchases on TpT. You get one TpT Credit for every $ you spend on TpT. Thing is, you only get the Credits after youProvide Feedback</a> -- both a fair rating and a fair comment -- on the items that you purchase. We will round up for you, too! If you provide fair feedback on a $4.75 item, you will earn 5 credits. Every 100 Credits is worth $5 that you can apply towards future TpT purchases, but there is no need to wait until you have 100 to redeem them. 50 credits is worth $2.50, for example.